Augustus Funeral Home regrets to announce the passing of Diane Elizabeth Peterson. A Home Going service for Diane Elizabeth Peterson, daughter of the late Grace Peterson and Eric Smith, loving mother to Brenton and Caro Peterson [Calvin], sister to Eric [late Carolyn], Roddy [Effie], Prudence Fraser [special], the late Leon ‘Shot’ Dill [Mabel], Dorothy Smith, Edna Brangman, in her 74th year of 2 High Point Lane, Devonshire will be held at St. John’s Church, Pembroke Today, November 19, 2018 at 2:00 pm. Relatives and friends may pay their last respects at Augustus Funeral Home Today, November 19, 2018 from 1:00 pm – 1:45 pm. 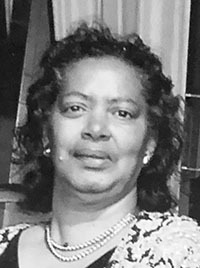 Lovingly remembered by grandchildren: Tinysha Clarke [Rohan], Brianna Peterson, Calvina Peterson-Mouchette; great grandchildren: Ravon, Raven, and Rilen Clarke; nieces: Malodie Julio [Clyde], Marita Grimes, Erica Jones [Charles], Charmette, Rhoda, Rodericka, Laverne, Sharon, Deborah, Beverley, Lauretta [Wayne] Stoneham, Ruth-Ann; nephews: Gary Dublin [Janet], Kenneth Dublin [Dawn], Bertram [Bert] Fraser [special], Shannon Dill; special friends: Gloria Usher and Family, Mouchette, Armstrong, Gibbons, Smith Families, Margaret Smith [special cousin], Mr. Simons, Grace Methodist Family, Vince Trott and Family, Rev. D’Wain Wales [Deborah], Augustus Family, Ms. Hill, Mr. and Mrs. James, Mrs. Bean, Mrs. Walker, Davona, Country, Pitcher Families, Phyliss Peterson, Albertha Darrell, Phyliss, Joanne [USA] Black Family, KFC Families, Shelton, Gino, Gitsy, Pascal, Lyndon, Melvin, Scott Family, Quita, Cal, Robert’s Ave neighbours; godchildren: Derrick Brangman, Darren [Butcher] Young, Cory Berkley, Jerome Dublin, Nadia; numerous great nieces, nephews, relatives and friends too mention. Diane Peterson was predeceased by nephews: Allan, David; best friends: Melody Furbert, Lucille Hart.